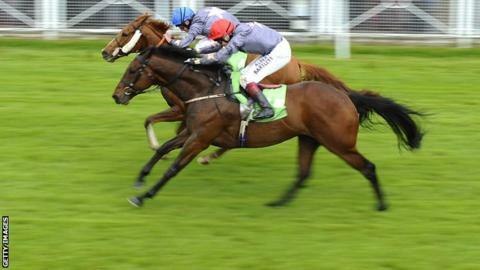 Suegioo edged Angel Gabrial to lead home a one-two for owner Dr Marwan Koukash in the Chester Cup. Koukash's pair battled it out up the final straight with 10-1 shot Suegioo proving half a length too good in the hands of jockey Ryan Moore. "I've won the Cup three times now, I'm taking it home!" Koukash said. "I'd say the plan for this horse is to win the Chester Cup again next year." Communicator took third, with 4-1 favourite Mubaraza finishing fourth. Angel Gabrial appeared to have made the winning manoeuvre under Jamie Spencer when he moved from last to first in around three furlongs. He hit the front at the top of the straight before fading and veering wildly, forcing Suegioo to go around. Winning jockey Moore said: "We were flat to the boards for the first quarter of a mile then it steadied up as it always does." Koukash, who owns rugby league side Salford Red Devils, added: "We believe Angel Gabrial is a very good horse and he ran a brilliant race today, I'm sure he's got a very bright future."